VATICAN CITY (CNS) — The liturgy should help the faithful enter into God’s mystery and to experience the wonder of encountering Christ, Pope Francis told priests of the Diocese of Rome. People should feel the wonder and allure “that the apostles felt when they were called, invited. It attracts — wonder attracts — and it lets you reflect,” the pope said during an annual Lenten meeting with Rome pastors in the Paul VI audience hall. 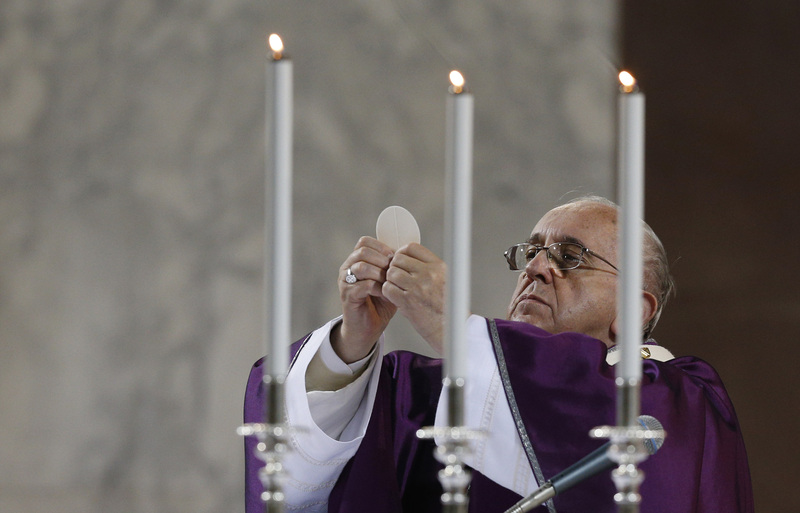 Sitting behind a table and talking off-the-cuff, glancing occasionally at a few pages of notes in front of him, the pope led the pastors Feb. 19 in a reflection on the homily and “ars celebrandi,” the art of celebrating the liturgy well. The Vatican press hall mistakenly broadcast via closed-circuit television the first 15 minutes of the encounter, which was meant to be closed to the media at the pope’s request so that he could speak more freely with his audience, said Passionist Father Ciro Benedettini, a Vatican spokesman. While the annual meeting had always been open to news coverage, Pope Francis has preferred private meetings with local clergy during his visits to different parishes in Italy, the spokesman said. Priests who attended the two-hour meeting said the pope spent about 40 minutes after his talk with a question-and-answer session — a format used frequently by St. John Paul II in meetings with priests and seminarians and by Pope Benedict XVI in the beginning of pontificate. Pope Francis told the priests that “the homily is a challenge for priests” and he said he, too, had his own shortcomings — pointed out in a reflection he prepared for a plenary meeting of the Congregation for Divine Worship and the Sacraments on “ars celebrandi” in 2005. As Cardinal Jorge Mario Bergoglio, he was a cardinal-member of the congregation. After he presented the reflection, he said, Cardinal Joachim Meisner “reprimanded me a bit strongly over some things,” as well as then-Cardinal Joseph Ratzinger, who “told me that something very important was missing in the ‘ars celebrandi,’ which was the feeling of being before God. And he was right, I had not spoken about this,” he said, adding that both cardinals had given him good advice. “For me the key of ‘ars celebrandi’ takes the path of recovering the allure of beauty, the wonder both of the person celebrating and the people, of entering in an atmosphere that is spontaneous, normal and religious, but isn’t artificial, and that way you recover a bit of the wonder,” he said. Sometimes there are priests who celebrate Mass in a way that is “very sophisticated, artificial,” or who “abuse the gestures” he said. If the priest is “excessively” focused on the rubrics that indicate the movements and particular gestures during Mass and “rigid, I do not enter into the mystery” because all one’s energy and attention are on the form, he said. The other extreme, he said, is “if I am a showman, the protagonist” of the Mass, “then I do not enter into the mystery” either. While the idea is simple, “it is not easy” to elicit this sense of wonder and mystery, he said. But nonetheless, he said, the celebration of Mass is about entering into and letting others enter into this mystery. The celebrant “must pray before God, with the community,” in a genuine and natural way that avoids all forms of “artificiality,” he said. The cardinal said they try to preach well, but are always looking for improvement. “We want our words to set people’s hearts on fire” and want the faithful “to be enlightened and encouraged to live a new life and never be forced to suffer through our homilies,” he said.